Jomar Electric Corporation offers value added services such as our night check program to commercial property owners in Manassas and other areas in Virginia. But unlike other contractors who charge a fortune for even the simplest services. However our company plays the game fairly by offering our services at rates that clients can afford. Get added to our free night inspection service for your properties. Just contact us to know how you can enroll in this service for free. 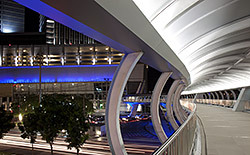 It does not take a genius to know that homes and business establishments should always have their lighting installations working at 100 percent working lighting installations at any given time. This is particularly true at night when properties should be well lit. Safety. At night when visibility is at near-zero, it helps to have a fully functional night lighting system all over your property. Be it a parking area, the garden, a walkway or driveway, or just about anywhere in a property with foot traffic, night lighting ensures that people will not trip or fall, or cars will not accidentally hit a barrier in and out of the property. Security. Keeping your property well lit at night helps keep potential intruders or burglars out of your business establishment. This is most needed in parking lots, back areas, and anywhere extremely dark and unguarded. It would also be a wise investment for commercial buildings, warehouses, hotels and restaurants. Aesthetic boost. With regular night check programs, you can also ensure that you can bring out the best that your property has to offer when the darkness sets in. 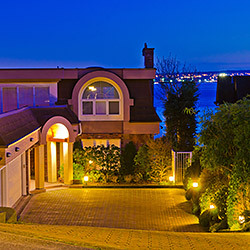 By having your outdoor lighting system checked by professionals like us, your property will always look great at night. Increased property value. 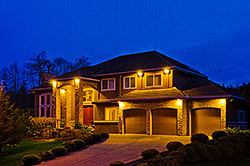 Having your property installed with great night lighting increases its selling price. This is because potential buyers are actually looking for such amenities when they consider which property listing to buy. With the above mentioned benefits, it is clear that you should only get professionals to make sure that all of your lighting fixtures are working. Ensure that your property night lighting is always in tip-top shape by enrolling in our night check program. When you participate in our affordable night check programs, we will regularly check your lighting installations to ensure they are functioning properly. With each visit, our certified electricians will note every problem and fix it accordingly. Also, if there are problems in your night lighting, we can fix them immediately so that there will be no safety risks. Our trucks are always loaded with the needed tools, equipment, and materials to address every imaginable lighting issue. For us, no lighting system problem is too small to merit our immediate attention. Aside from lights outages, our staff can also check faulty lighting installations, including safety boxes, switches, and wirings. If a problem is found, our people will perform the needed remedy to guarantee neither a short circuit nor a electrical hazard will be lurking on your property. Contact us today and let us provide you great benefits with our night check program. With us, you are guaranteed of positive results with the expertise of our personnel, as well as the appropriate and complete tools and equipment that we have. A service benefit you can get free of charge. Call us now at 703-368-2065.